Paracetamol and cyclooxygenase inhibition: is there a cause for concern? Paracetamol is recommended as first-line therapy for pain associated with osteoarthrosis and is one of the most widely used over-the-counter analgesic drugs worldwide. Despite its extensive use, its mode of action is still unclear. Although it is commonly stated that paracetamol acts centrally, recent data imply an inhibitory effect on the activity of peripheral prostaglandin-synthesising cyclooxygenase enzymes. In this context paracetamol has been suggested to inhibit both isoforms in tissues with low levels of peroxide by reducing the higher oxidation state of cyclooxygenase enzymes. Two recent studies have also demonstrated a preferential cyclooxygenase 2 (COX-2) inhibition by paracetamol under different clinically relevant conditions. This review attempts to relate data on paracetamol's inhibitory action on peripheral cyclooxygenase enzymes to the published literature on its anti-inflammatory action and its hitherto underestimated side-effects elicited by cyclooxygenase inhibition. As a result, a pronounced COX-2 inhibition by paracetamol is expected to occur in the endothelium, possibly explaining its cardiovascular risk in epidemiological studies. A careful analysis of paracetamol's cardiovascular side-effects in randomised studies is therefore strongly advised. On the basis of epidemiological data showing an increased gastrointestinal risk of paracetamol at high doses or when co-administered with classic cyclooxygenase inhibitors, paracetamol's long-term gastrointestinal impact should be investigated in randomised trials. Finally, paracetamol's fast elimination and consequently short-lived COX-2 inhibition, which requires repetitive dosing, should be definitely considered to avoid overdosage leading to hepatotoxicity. Instead, several data published during the past few years suggest a tissue-dependent inhibitory effect of paracetamol on the activity of both central and peripheral cyclooxygenase enzymes. In view of the current debate concerning the safety of cyclooxygenase inhibitors, these findings raise several questions with respect to hitherto underestimated cyclooxygenase-dependent side-effects of paracetamol, which has long been regarded as a safe alternative to traditional non-steroidal anti-inflammatory drugs (NSAID) and latterly also to selective COX-2 inhibitors. In the present review attempts have been undertaken to relate the data on the cyclooxygenase inhibitory potency of paracetamol to the published literature on its anti-inflammatory action and, more importantly, side-effects possibly related to inhibition of cyclooxygenase enzymes. 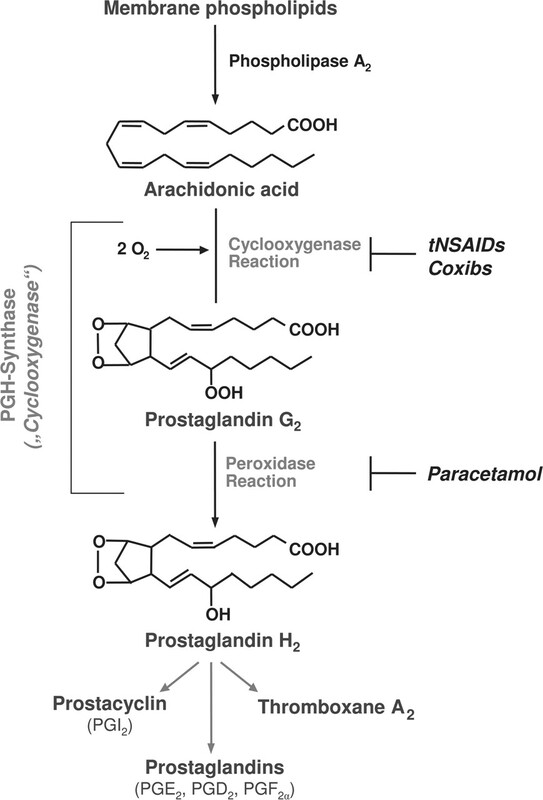 The pathway leading to the generation of prostaglandins has been elucidated in detail. Within this process, the cyclooxygenase enzyme (also referred to as prostaglandin H (PGH) synthase) catalyses the first step of the synthesis of prostanoids by converting arachidonic acid into PGH2, which is the common substrate for specific prostaglandin synthases. The enzyme is bifunctional, with fatty-acid cyclooxygenase activity (catalysing the conversion of arachidonic acid to prostaglandin G2 (PGG2)) and prostaglandin hydroperoxidase activity (catalysing the conversion of PGG2 to PGH2) (figure 1). Biochemical function of the cyclooxygenase enzyme and pharmacological targets within its two activity sites. Paracetamol acid released from membrane phospholipids by the enzyme phospholipase A2 is converted by cyclooxygenase (also referred to as prostaglandin (PG) H synthase) to PGH2, the common substrate for specific prostanoid synthases. Cyclooxygenase is bifunctional, with fatty-acid cyclooxygenase activity (catalysing the conversion of arachidonic acid to PGG2) and prostaglandin hydroperoxidase activity (catalysing the conversion of PGG2 to PGH2). Traditional non-steroidal anti-inflammatory drugs (tNSAID) and selective cyclooxygenase 2 inhibitors (coxibs) compete with arachidonic acid for entering the cyclooxygenase reaction. In contrast, paracetamol may act as a reducing agent within the peroxidase site by quenching a radical that is responsible for the propagation of the cyclooxygenase reaction. In view of the fact that hydroperoxides oxidise the porphyrin within the peroxidase site, cyclooxygenase inhibition by paracetamol is hampered by high peroxide levels. Accordingly, Boutaud et al10 showed that high levels of peroxides overcome the inhibitory effect of paracetamol on the cyclooxygenase enzymes in diverse cells. As such, 12-hydroperoxyeicosatetraenoic acid, a major product of platelets, completely reversed the inhibitory action of paracetamol on COX-1. Likewise, the addition of peroxides to interleukin 1-stimulated endothelial cells (as a model of a peroxide-enriched inflammatory tissue) abrogated COX-2 inhibition by paracetamol, whereas paracetamol inhibited COX-2 in the absence of peroxide at concentrations relevant to its antipyretic effect. Two recent studies have suggested a preferential COX-2 inhibitory action of paracetamol under different clinically relevant conditions. In the first of these studies, Hinz et al11 using the ex-vivo human whole blood assay were able to show that oral administration of 1 g paracetamol to human volunteers inhibits blood monocyte COX-2 by up to 80% (figure 2). According to Huntjens et al12 ex-vivo COX-2 inhibition in the whole blood assay by approximately 80% is expected to result in analgesia due to the fact that the analgesic therapeutic plasma concentration of a cyclooxygenase inhibitor correlates with its inhibitory concentration (IC)80 (the concentration that leads to 80% inhibition) on COX-2 in the human whole blood assay. However, due to its short half-life (approximately 2 h) paracetamol elicits a short-lived COX-2 inhibition only (figure 2). Thus, repetitive 1-g doses of paracetamol have to be administered to provide a permanent 80% COX-2 inhibition necessary for pain relief. This fact has to be considered to avoid overdosages with this drug. Plasma concentrations of paracetamol (A) and ex-vivo inhibition of cyclooxygenase 1 (COX-1) and cyclooxygenase 2 (COX-2) activity (B) following oral administration of 1 g paracetamol to five volunteers (data are from Hinz et al).11 Peripheral venous blood samples were taken from each subject immediately before and at specified time points postadministration. For the determination of ex-vivo COX-1 activity, whole blood samples without anticoagulant were incubated for 1 h at 37°C immediately after blood sampling. Subsequently, serum thromboxane B2 levels were determined as the index of COX-1 activity. In the case of COX-2, heparinised whole blood samples were incubated with lipopolysaccharide (10 µg/ml) and aspirin (10 µg/ml; prevents a contribution of platelet COX-1) for 24 h at 37°C. Afterwards, plasma levels of prostaglandin E2 were determined as the index of COX-2 activity. Values are means±SEM. The inhibitory concentration (IC50) values in the left figure are based on in-vitro experiments. In another study using a clinical model of tissue injury and acute inflammation, outpatients received 1 g paracetamol before surgical removal of two impacted mandibular third molars and microdialysis was performed to collect inflammatory transudate from the surgical site for the measurement of COX-1 and COX-2-dependent prostanoid levels at the site of injury.15 Again, paracetamol was revealed as a selective inhibitor of COX-2-dependent prostaglandin E2 (PGE2) formation. Most pharmacological reference books depict paracetamol as a ‘pure’ analgesic without any anti-inflammatory activity. This claim is largely based on early work showing that paracetamol does not suppress serious inflammation associated with rheumatoid arthritis.16 17 This lack of effect can now be explained by the high extracellular concentrations of arachidonic acid and peroxide in the inflamed tissue, both of which diminish the effect of paracetamol on prostaglandin synthesis.4 9 10 In line with this notion paracetamol does not decrease the concentration of diverse prostanoids in the synovial fluid of patients with rheumatoid arthritis.18 On the other hand, paracetamol decreases tissue swelling following oral surgery in humans, with activity similar to that of ibuprofen,19 20 implying that the drug is not devoid of any anti-inflammatory action. Moreover, the above-cited study15 implies a significant impact of COX-2 inhibition to this response. In addition, a peripheral anti-inflammatory action is supported by several experimental studies showing paracetamol to be an inhibitor of nociception and oedema in the rat carrageenan footpad model,21 22 an inflammatory condition critically dependent on COX-2-derived prostaglandins.23 Therefore, the notion that paracetamol has only weak anti-inflammatory properties rather than causing no anti-inflammatory action at all appears to be more favourable. In addition to these reports, inhibition of the lipopolysaccharide-induced PGE2 synthesis measured ex vivo in whole blood has been shown to correspond to the inhibition of the urinary excretion of 2.3-dinor 6-keto PGF1α,32 On the basis of this and other findings, ex-vivo COX-2 measurements from whole blood have been suggested as a potential surrogate to estimate the cardiovascular risk of a certain cyclooxygenase inhibitor.25 33 34 In view of the up to 80% COX-2 inhibition by paracetamol in the ex-vivo whole blood assay (figure 2), a comparable effect in the endothelium is expected to confer a cardiovascular risk. In fact, epidemiological data suggest that such a concern is justified: Regarding the effects of paracetamol on blood pressure, two prospective cohort studies among younger and older women from the Nurses' Health Studies found that regular consumption of paracetamol at over 500 mg/day was associated with a significantly higher relative risk (RR) for the development of hypertension compared with no use (RR 1.93, older women; RR 1.99, younger women).35 It is noteworthy that the risk of paracetamol was similar to that of traditional NSAID (RR 1.78, older women; RR 1.60 younger women). Another large, prospective cohort study36 by the same group showed that women who frequently (≥22 days per months) consumed paracetamol had nearly the same risk of major cardiovascular events (non-fatal myocardial infarction, fatal coronary heart disease, non-fatal and fatal stroke) as traditional NSAID (RR 1.35, paracetamol; RR 1.44, traditional NSAID). Likewise, the use of paracetamol at 15 tablets or more per week conferred a risk of a cardiovascular event comparable to traditional NSAID (RR 1.68, paracetamol; RR 1.86, traditional NSAID).36 Key data of this study are summarised in table 1. These epidemiological data are supported by a recently published randomised, double-blind, placebo controlled, crossover study demonstrating that paracetamol induces a significant increase in ambulatory blood pressure in patients with coronary artery disease.37 In that study including 33 patients with coronary artery disease who received paracetamol (1 g three times a day) on top of standard cardiovascular therapy for 2 weeks, treatment with paracetamol resulted in a significant increase in mean systolic (from 122.4±11.9 to 125.3±12.0 mm Hg; p=0.02 vs placebo) and diastolic (from 73.2±6.9 to 75.4±7.9 mm Hg; p=0.02 vs placebo) ambulatory blood pressures. The authors concluded that the use of paracetamol should be evaluated as rigorously as traditional NSAID and COX-2 inhibitors, particularly in patients at increased cardiovascular risk. However, attempts to clarify the mechanism of blood pressure elevation in the study were inclusive, making further investigations necessary. COX-1 initiates platelet aggregation by virtue of its product thromboxane A2, which is rapidly converted into its inactive metabolite thromboxane B2. Therefore, blockade of COX-1 is the basis of the anti-aggregatory action of traditional NSAID on platelets. Paracetamol is a weak inhibitor of platelet COX-1 that elicits COX-1 suppression in clotting whole blood with IC50 values of 113.7 µmol/l (in vitro) and 105.2 µmol/l (ex vivo), respectively.11 Oral administration of 1 g paracetamol causing maximal plasma concentrations of 104.8 µmol/l results in an approximately 50% inhibition of COX-1 accordingly.11 Early investigations with this assay, which uses endogenous thrombin generated during a 1 h blood clotting as COX-1 stimulus, implied a greater than 95% COX-1 inhibition as necessary for suppression of the inhibition of platelet function.13 In line with this notion, paracetamol does not interfere with platelet function when given at single oral doses of 1 g38 or up to 1.95 g.39 It is noteworthy that the concentration of exogenous arachidonic acid used in several assays determines the potency of paracetamol to interfere with platelet COX-1.10 According to Boutaud et al10 an inhibitory action of paracetamol on platelet COX-1 comparable to that obtained in clotting whole blood is obtained when using low concentrations (0.5 µM) of exogenous arachidonic acid. Concerning paracetamol's impact on human gastric mucosal prostaglandin formation only a limited number of studies exist. Whereas paracetamol had no effect on prostaglandin synthesis on gastric mucosa when added in vitro,44 another study reports significant inhibitions of PGE2-like activity in the gastric mucosa of duodenal ulcer patients after the oral administration of paracetamol.45 Decreases in PGE2 levels by approximately 40% (fundus) and 60% (antrum) were observed following the administration of 2.5 g paracetamol given in divided 500 mg doses during a single day.45 Although this inhibition was less pronounced when compared with 2.5 g aspirin and accompanied by only mild gastroscopic mucosal changes,45 the study points to the principal capacity of paracetamol to interfere with gastric prostaglandin synthesis. Accordingly, much more pronounced inhibitions are expected to occur following the administration of divided 1 g doses or extended dosing regimes (4 g/day). The apparently favourable gastrointestinal tolerability of paracetamol compared with traditional NSAID is often cited with regard to a 7-day randomised trial, in which healthy volunteers receiving paracetamol 4 g/day showed no significant difference from the placebo group in terms of gastric mucosal injuries.46 However, this advantage is likely to be diminished when higher paracetamol doses are given for a longer period to patients. In this context it is worthy of note that gastroduodenal lesions are considered to develop as a consequence of persistent, moderate inhibition of mucosal COX-1, while bleeding complications occur as a result of transient, high-grade inhibition of COX-1.47 Unfortunately, no long-term endoscopy study has been performed with paracetamol so far. However, observational studies suggest that higher doses of paracetamol taken for a longer period of time may elicit a gastrointestinal risk profile similar to traditional NSAID. In the first of these studies, the group of Garcia-Rodriguez and Hernández-Díaz48 analysed upper gastrointestinal complications in almost 1 million patients receiving paracetamol and/or traditional NSAID during a 5-year investigation period. The RR for paracetamol showed a clear dose-dependence with an adjusted RR for paracetamol of 3.6 at doses greater than 2 g. In addition, the combined administration of traditional NSAID and paracetamol was associated with an overadditive increase of RR.49 These results were supported by a recently published retrospective cohort study on 644 183 old (>65 years) patients receiving paracetamol and/or traditional NSAID during a 6-year investigation period.50 In that study the risk of hospitalisation due to gastrointestinal events (ulcer, perforation, bleeding in upper or lower gastrointestinal tract) was shown to be twice as high following the combined administration of paracetamol with traditional NSAID compared with the use of traditional NSAID alone (table 2). The authors explained this finding by paracetamol's additional COX-1 inhibition, which is plausible in view of data showing paracetamol to augment diclofenac's inhibitory action on platelet aggregation in a synergistic manner.43 The study by Rahme et al50 concludes with the recommendation to avoid the use of traditional NSAID in combination with paracetamol. Clearly, epidemiological studies that might include several confounding factors do not replace controlled trials. However, in this case they definitely refer to a dose-dependency of gastrointestinal toxicity by paracetamol, the long-term gastrointestinal impact of which should eventually be investigated in randomised studies including patients with osteoarthrosis. A first attempt in this direction has recently been published with a randomised, active controlled trial on 892 participants with chronic knee pain, most of them fulfilling the American College of Rheumatology criteria for knee osteoarthritis.51 On the basis of haemoglobin levels measured the authors state that paracetamol 3 g/day may cause similar degrees of blood loss as ibuprofen 1.2 mg/day, and that the combination of the two appears to be additive, or even synergistic in terms of the number of individuals with a greater than 2 g/dl decrease in haemoglobin.51 Although the clinical relevance of these decreases remains to be determined, the authors state that these investigational results challenge the belief that paracetamol is the treatment of choice based on an absent/lower risk of gastrointestinal complications compared with ibuprofen. Preferential inhibition of COX-2 by paracetamol may explain clinical observations showing that paracetamol does not elicit a gastrointestinal toxicity comparable to traditional NSAID in endoscopy studies when administered at recommended doses for a few days only and does not inhibit platelet function when given at single oral doses up to 1.95 g. Paracetamol's potency as a COX-2 inhibitor strongly depends on the oxidant/antioxidant status of the surrounding system. However, a pronounced COX-2 inhibition by paracetamol is expected to occur in the endothelium, possibly explaining the cardiovascular risk associated with the long-term use of this drug as shown in epidemiological studies. A careful analysis of paracetamol's cardiovascular risk in randomised studies is therefore strongly advised. In addition, epidemiological data imply an increased gastrointestinal risk of paracetamol when given at high doses for a prolonged time as well as when co-administered with traditional NSAID. Finally, paracetamol's fast elimination and consequent short-lived COX-2 inhibition should be considered to avoid overdosages leading to the well-known hepatotoxic side-effects of the drug. Collectively, there are accumulating data raising concern over the presumed safety of paracetamol compared with traditional NSAID with respect to side-effects related to cyclooxygenase inhibition. A more sceptical awareness as well as a more critical research on this old drug is therefore strongly advised.
. Update of ACR guidelines for osteoarthritis: role of the coxibs. J Pain Symptom Manage 2002;23(4 Suppl):S24–30; discussion S31–4.
. Mechanism of action of acetaminophen: is there a cyclooxygenase 3? Clin Infect Dis 2000;31(Suppl 5):S202–10.
. Inhibition of prostaglandin synthetase in brain explains the anti-pyretic activity of paracetamol (4-acetamidophenol). Nature 1972;240:410–11.
. Mechanism of action of paracetamol. Am J Ther 2005;12:46–55.
. COX-3, a cyclooxygenase-1 variant inhibited by acetaminophen and other analgesic/antipyretic drugs: cloning, structure, and expression. Proc Natl Acad Sci U S A 2002;99:13926–31.
. Acetaminophen and the cyclooxygenase-3 puzzle: sorting out facts, fictions, and uncertainties. J Pharmacol Exp Ther 2005;315:1–7.
. Synthesis and use of iodinated nonsteroidal antiinflammatory drug analogs as crystallographic probes of the prostaglandin H2 synthase cyclooxygenase active site. Biochemistry 1996;35:7330–40.
. Kinetic basis for selective inhibition of cyclo-oxygenases. Biochem J 1999;339:607–14.
. Mechanism of acetaminophen inhibition of cyclooxygenase isoforms. Arch Biochem Biophys 2001;387:273–80.
. Determinants of the cellular specificity of acetaminophen as an inhibitor of prostaglandin H(2) synthases. Proc Natl Acad Sci U S A 2002;99:7130–5.
. Inhibition of thromboxane formation in vivo and ex vivo: implications for therapy with platelet inhibitory drugs. Blood 1987;69:180–6.
. The antioxidants of human extracellular fluids. Arch Biochem Biophys 1990;280:1–8.
. Clinical measurement of the anti-inflammatory effects of salicylates in rheumatoid arthritis. BMJ 1967;4:264–8.
. Quantitation of thermography in arthritis using multi-isothermal analysis. II. Effect of nonsteroidal anti-inflammatory therapy on the thermographic index. Ann Rheum Dis 1974;33:353–6.
. Comparison of the effects of different anti-inflammatory drugs on synovial fluid prostanoid concentrations in patients with rheumatoid arthritis. Clin Rheumatol 1985;4:315–20.
. Paracetamol versus placebo: effects on post-operative course. Eur J Clin Pharmacol 1979;15:27–33.
. A randomized, double-blind crossover trial of paracetamol 1000 mg four times daily vs ibuprofen 600 mg: effect on swelling and other postoperative events after third molar surgery. Br J Clin Pharmacol 2003;55:405–12.
. Blockade of central and peripheral generation of prostaglandins explains the antialgic effect of aspirin like drugs. Pol J Pharmacol Pharm 1978;30:133–40.
. Aspirin and acetaminophen reduced both Fos expression in rat lumbar spinal cord and inflammatory signs produced by carrageenin inflammation. Pain 1995;63:365–75.
. Pharmacological analysis of cyclooxygenase-1 in inflammation. Proc Natl Acad Sci U S A 1998;95:13313–18.
. More pronounced inhibition of cyclooxygenase 2, increase in blood pressure, and reduction of heart rate by treatment with diclofenac compared with celecoxib and rofecoxib. Arthritis Rheum 2006;54:282–91.
. The effect of acetaminophen on prostacyclin production in pregnant women. Am J Obstet Gynecol 1993;168:1164–9.
. Pronounced reduction of in vivo prostacyclin synthesis in humans by acetaminophen (paracetamol). Prostaglandins 1989;37:311–15.
. Preeclampsia: an imbalance in placental prostacyclin and thromboxane production. Am J Obstet Gynecol 1985;152:335–40.
. Mechanisms of disease: pre-eclampsia. Nat Clin Pract Nephrol 2005;1:98–114; quiz 120.
. Is it time to re-evaluate our use of acetaminophen in certain sub-groups of pregnant women? J Matern Fetal Neonatal Med 2008;21:761–2.
. Use of acetaminophen during pregnancy and risk of preeclampsia, hypertensive and vascular disorders: a birth cohort study. J Matern Fetal Neonatal Med 2010;23:371–8.
. Systemic biosynthesis of prostacyclin by cyclooxygenase (COX)-2: the human pharmacology of a selective inhibitor of COX-2. Proc Natl Acad Sci U S A 1999;96:272–7.
. Can drug removals involving cyclooxygenase-2 inhibitors be avoided? A plea for human pharmacology. Trends Pharmacol Sci 2008;29:391–7.
. Role of dose potency in the prediction of risk of myocardial infarction associated with nonsteroidal anti-inflammatory drugs in the general population. J Am Coll Cardiol 2008;52:1628–36.
. Comparative effects of aspirin and acetaminophen on hemostasis. Arch Intern Med 1981;141:305–10.
. Platelet dysfunction after intravenous ketorolac or propacetamol. Acta Anaesthesiol Scand 2000;44:69–74.
. Dose-dependent inhibition of platelet function by acetaminophen in healthy volunteers. Anesthesiology 2005;103:712–17.
. Propacetamol augments inhibition of platelet function by diclofenac in volunteers. Br J Anaesth 2003;91:357–62.
. On the synthesis of prostaglandins by human gastric mucosa and its modification by drugs. Biochim Biophys Acta 1977;487:307–14.
. Distribution of prostaglandins in gastric and duodenal mucosa of healthy subjects and duodenal ulcer patients: effects of aspirin and paracetamol. Gut 1981;22:283–9.
. An endoscopic comparison of gastroduodenal injury with over-the-counter doses of ketoprofen and acetaminophen. Am J Gastroenterol 1998;93:1051–4.
. Cyclooxygenase-selective inhibition of prostanoid formation: transducing biochemical selectivity into clinical read-outs. J Clin Invest 2001;108:7–13.
. Relative risk of upper gastrointestinal complications among users of acetaminophen and nonsteroidal anti-inflammatory drugs. Epidemiology 2001;12:570–6.
. The risk of upper gastrointestinal complications associated with nonsteroidal anti-inflammatory drugs, glucocorticoids, acetaminophen, and combinations of these agents. Arthritis Res 2001;3:98–101.
. Mechanisms of aspirin sensitivity. Curr Allergy Asthma Rep 2006;6:198–202.
. Systematic review of prevalence of aspirin induced asthma and its implications for clinical practice. BMJ 2004;328:434.
. Prevalence of cross-sensitivity with acetaminophen in aspirin-sensitive asthmatic subjects. J Allergy Clin Immunol 1995;96:480–5.